In a recent post I expressed frustration that conventional economics seems to have survived the meltdown of 2008 almost unscathed, as evidenced the chatter around the discussion of monetary policy. 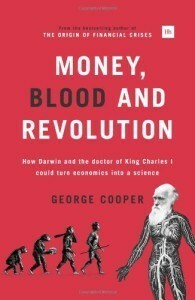 I mentioned one book, George Cooper’s Money, Blood and Revolution, that sought challenge it. On the strength of that the publisher sent me a review copy – and I have read it. It is interesting because the paradigm shift Mr Cooper advocates gives coherence to the idea of liberal economics, after its original conception turned out to mean libertarian economics. Mr Cooper’s main thesis is that economics is a science that is in crisis (as opposed to the alternative view that it should not be considered scientific at all). He compares it to four specific cases of sciences in crisis: astronomy before Copernicus, anatomy before William Harvey established the principles of blood circulation, biology before Darwin/Wallace’s idea of evolution by natural selection; and geology before the acceptance of continental drift. Nearly a third of the book is devoted to developing this idea, before he gets to the discipline of economics itself. The geology example is close to my heart. My father is a geologist, and I studied it at my first stint at university, at Cambridge in 1976-78 (I studied History in my final year – another story). My father had accepted the idea of continental drift – the notion that the continents are moving across the surface of the earth – by the 1960s, before the scientific establishment completely accepted it. By 1976 the idea of plate tectonics was conventional wisdom, and continental drift was treated as an obvious fact. What had made the difference (actually not mentioned by Mr Cooper) is that mapping of the ocean floor showed that the oceans were spreading, neatly illustrated by stripes of different magnetic polarity, following reversals in the earth’s magnetic field when the ocean crust was formed. It was new, killer evidence. Mr Cooper rather suggests that it was looking at existing evidence in a new way that led to the revolution. But that is a minor quibble – there was growing opinion behind the continental drift idea before the oceanographic evidence emerged. The book is not a heavy read. It is less than 200 pages and it goes at quite a clip. It is well written, apart from a couple of quibbles. He uses the word “experimental” in place of “empirical” for real-world evidence. Perhaps his publisher advised him it was more accessible, but in my book experimental means carrying out experiments. There is a branch of experimental economics, but it is tiny. Empirical evidence in economics is gleaned from examining the shape of the real world, only rarely with controlled studies – a bit like astronomy, geology and evolutionary biology, in fact. His use of “principle” when he means “principal” looks accidental but I counted two instances. This lightness of touch has advantages and disadvantages. It will help him with general readers; it will leave professionals picking holes. His focus is on the former since he judges that the demand for a paradigm shift is likely to be strongest from those outside the discipline. But we still need people in the discipline to flesh out the new ideas. 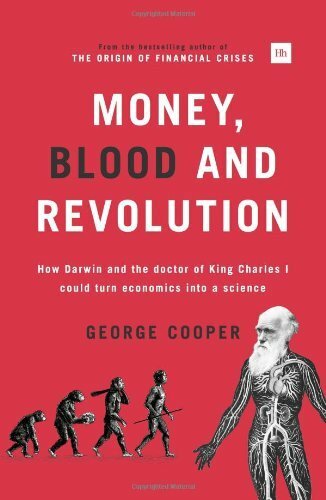 Moving on from the idea of scientific revolutions, Mr Cooper then explores the state of current economics, describing all the main schools of thought, each with ideas incompatible with others. I found this section illuminating and enjoyable. He could perhaps have brought out more the capacity for professional economists to engage in double-think – for the same people to hold incompatible ideas in their own heads, never mind the presence of warring factions who look on the same facts in different ways. But Mr Cooper rightly says that it is not enough to prove the existing ideas wrong; you have to replace them with new ideas that work better. He outlines a new system of thought, based on two new concepts: competition and circulation of wealth. Economists have much to say about competition, but it turns out that what they mean by the word is an artificial, anaemic version of the concept, operating within tightly constrained rules, where the object is to maximise individual welfare. The real human competition that drives human behaviour is about survival and status; it is about getting ahead of the other guy and staying there. Crucially it is about relative position and not absolute wealth. If competitive behaviour dominates, then human society will tend to stratify into a feudal system with a hereditary elite maintaining its dominance by force. Since such feudal societies are very common, including in newly developed social systems like that of North Korea, it is clear that such competition often dominant. It undermines the idea of libertarianism, which advocates minimal government and regulation, since these last two are required to counteract the tendency to feudalism. Cooper’s second idea, that of circulation, stems from the observation that feudal societies are economically inefficient (look at North Korea again). Once the ruling elite have secured their status, they hold the rest of society in a static position so as not to present a threat. Economies are drained of vitality because the poor have no spending money, and the elite tend to hoard their wealth rather than spread it around. Democratic societies, on the other hand, have developed institutions, like progressive taxation, universal welfare and so on that recycle wealth from the wealthy to the rest, and competitive elections that ensure that political elites are recycled too. This creates a productive tension. Competition gives people the motivation to build successful businesses (and political careers) and innovate; governments recycle the wealth thus generated to prevent it from stifling the system. This is a very liberal view. The right sees only a limited role for government and taxes, and does not accept that the presence of a very wealthy elite stifles the wellbeing of society. The left thinks that competition is destructive and tries to stifle it through excessive government. Liberals understand that people must be free to compete, but that government institutions are required to prevent all the power accumulating to the wealthy. What does that mean in policy terms? Mr Cooper is particularly critical of the idea of monetarism – the management of the economy through regulating money and credit in the economy as a whole. He thinks this idea is largely to blame for the crisis, and it won’t help us out of it. The extra spending power it creates goes to the wrong people, i.e. the very wealthy. They either let the new cash fester unspent, or use it to create an asset bubble. Spending power needs to go the other end of society, which means Keynesian stimulus, focusing especially on productive investment. This sounds quite sensible. I am personally deeply sceptical of monetarism, though I don’t take the argument quite as far as Mr Cooper does. How to take this new paradigm forward? It is starting to happen. Politicians and economists are talking a lot more about the distribution of wealth; this needs to be put back at the heart of macroeconomics – as it was two centuries ago with the ideas of Thomas Malthus. The publication of and interest generated by Thomas Piketty’s Capital in the 21st Century is big step in the right direction. This adds a lot of flesh to the high level analysis, and may provide the first evidence of magnetic stripes on the ocean floor. But there is a problem at the heart of economics which Mr Cooper barely considers, and which has to fixed. It is the public’s insatiable desire for economic forecasts, both to gauge the general economic weather, and to answer what-if scenarios (such as global warming). So far the only practical way of delivering these is through the use of neoclassical models using the ideas of independent, rational agents, optimising behaviour and equilibrium. The whole infrastructure of these ideas has to be taught to economics students to satisfy this demand. It is no use just saying that forecasting is going to be more difficult. If the discipline is to be regarded as a science, then new methods must be developed. I suspect that economics has much to learn from weather forecasting – another system that is never allowed to achieve equilibrium. Weather forecasts require very big computers which are able to model complex interactions between many component parts. Work is needed on something similar – massive multi-agent models, using insights into real human behaviour. Beyond that, I would like to see ideas on human behaviour, such as tendencies to cooperation and competition, developed in a much more realistic and nuanced context, harnessing the disciplines of anthropology, sociology and psychology – replacing the rather crude Darwinism that Mr Cooper advances. That said, liberals everywhere should take Mr Cooper’s ideas seriously.